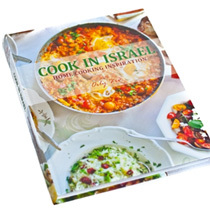 Nutritionist, cooking instructor, and culinary tour guide Orly Ziv is pleased to announce the release of her first cookbook, Cook in Israel: Home Cooking Inspiration with Orly Ziv. Filled with 100 kosher, mostly vegetarian recipes accompanied by beautiful color photographs (including many step-by-step illustrations), the cookbook shows that healthy and delicious home cooking doesn’t need to be time consuming or complicated. Drawing on her Jewish-Greek heritage and the Middle Eastern and Mediterranean flavors of her Tel Aviv home, Orly focuses on fresh flavors and simple techniques that are as suitable for weeknight meals as they are for entertaining. Through her company, Cook in Israel, Orly welcomes people from around the world into her city and her home to get to know her culture through food and cooking. Now, this experience is available to anyone, anywhere through her cookbook.